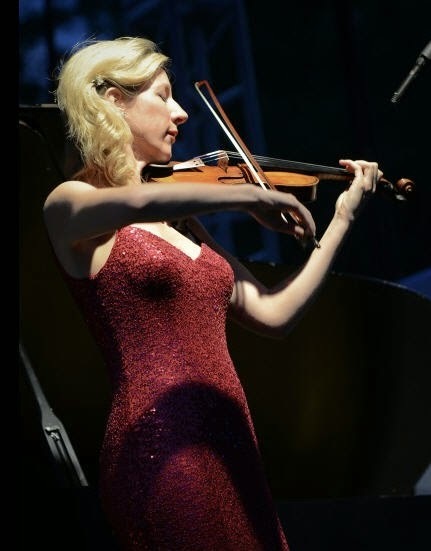 John Corigliano’s “The Red Violin: Chaconne for Violin and Orchestra” received a finely honed interpretation from Elizabeth Pitcairn, who performed it with the Portland Columbia Symphony in front of a fairly full house at First United Methodist Church on Friday evening (November 21). Pitcairn really owns this piece, in part, by virtue of the instrument she plays. It’s the Red Mendelssohn Stradivarius of 1720, which is said to have been the inspiration for the “The Red Violin” movie, which won an Academy Award for best original score (Corigliano’s, of course). The red Strad has been in Pitcairn’s possession since she was a teenager, when her grandfather purchased it for her, and, in her introductory remarks, she mentioned that she has given it the nick name of Felix, because it used to belong to the Mendelssohn family. Pitcairn’s playing of Corigliano’s suite was impeccable, and some of the best moments came during the serene and wistful passages that were delicate and very high. She deftly expressed the agitated and loud sections, which featured fleet fingerwork. A couple of the rising passages might have had more impact if she could have put more of an edge at the end of the phrase, because her tone got lost in the swelling crescendo from the orchestra. But it may be that the acoustic at First United Methodist just swallows up that sound no matter how loud the soloist plays. The orchestra, under its new Music Director Steven Byess, did an excellent job in creating tension and releasing it. The snaps from the percussion section and the snarls from the woodwinds and brass were very effective. Following the thunderous applause, Pitcairn mesmerized the audience with the “Allegro” from Fritz Kreisler’s “Praeludium and Allegro,” and elicited another standing ovation. After intermission, the orchestra gave a spirited performance of Edward Elgar’s “Enigma Variations.” It was delightful to hear all of the twists and turns that Elgar gave to the main theme. The most famous variation, "Nimrod," featured a wonderful slow crescendo that blossomed and created a grand, noble statement that also has a hint of sadness. Intonation in the strings got a little blurred during fast passages in some of the variations. Solo contributions by the principal bassoonist, violist, and cellist in the final variations, plus the plaintive clarinet and the swelling organ in the final movement highlighted the performance. The concert began with Stokowski’s orchestral arrangement of Bach’s “Toccata and Fugue in D minor.” It’s always fun to hear which instruments get to handle a particular passage, and it seemed to me that the pairing of the bassoon with the lower strings and a later section that featured a wicked bassoon riff were the best. Just over a week ago, on Sunday afternoon (November 9th) at St. Mary’s Cathedral, the Portland Symphonic Choir performed Mozart’s Requiem and Tarik O’Regan’s “Triptych.” With a large chorus (almost 140 voices) and an orchestra, there could have been an acoustical disaster in St. Mary's, But fortunately the choir, trained impeccably by Artistic Director and Condutor Steven Zopfi, was in top form for both works. For many listeners, Mozart’s Requiem is comfort food to the ears, one of those all-time great chorale works that soothes the soul. The Portland Symphonic Choir gave a fantastic performance, with excellence in diction, dynamics, balance, and tonal quality. It was just too bad that they had to sing this work in a space that is so boomy. The music would have had more of a personal touch if the choir could have stood closer to the audience, but the immovable altar in St. Mary's prevents that. Still, there was much to admire, including Angela Niederloh’s warm mezzo and Robert McPherson’s vibrant tenor. Emily Kalteich’s soprano voice needed more conviction, and Kevin Helppie’s baritone was lovely, yet his voice was overrun by the trombonist during the “Tuba mirum” movement. The orchestra played well, but the sound became a little muddled during the faster sections. This may have been caused by poor sightlines, because the musicians were spread over different levels. Zophi chose tempos and dynamics that fit the nave as well as possible, and the audience responded enthusiastically after the final notes settled to the floor. The pleasant surprise of the concert was Tarik O’Regan’s “Triptych.” O’Regan is a British composer (born in 1978), whose works have resonated well with audiences. His music, represented in a discography of 25 albums, has received two Grammy nominations and two British Composer awards. “Triptych” is an engaging, tonal piece in three movements that deals with death from several perspectives. The first movement, “Threnody” discusses the presence of death and that it is not to be feared. It includes text from William Penn, Muhammad Rajab Al-Bayuoumi (an Egyptian poet), William blake, and Psalm 133 of the Bible. Vocal lines were threaded together in enticing ways that seemed to blend a Middle Eastern sound with a hint of Minimalism. The orchestra and chorus picked up steam heading into the third movement, “From Heaven Distilled a Clemency.” Phrases from Indian Bundahishn, the Persian Sufi mystic Rumi, William Wordsworth, and Thomas Hardy made up the textual fabric. Some phrases that were repeated had an appealing rhythmic urgency. The commotion cleared out briefly so that we could hear Braun wistfully sing of “peace on earth, and silence in the sky” before the choir and orchestra returned with full force to drive home the words “Why then should I be afraid? I shall die once again to rise an angel blest.” That brought the listeners out of their seats with heartfelt applause. Portland Opera kicked off its 50th anniversary celebration with a high-spirited performance of “Die Fledermaus” on Friday night (November 7th) at Keller Auditorium. 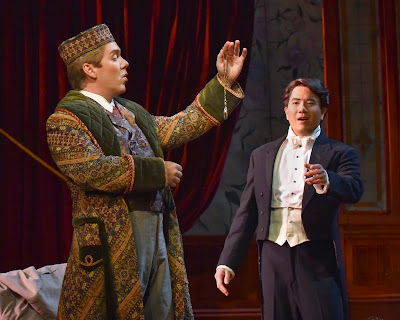 The funny and light-hearted story of this opera, laced with a pearl string of waltz-inflected tunes, generated lots of frothy warmth to a full house. It fittingly harkened back to the very first production of Portland Opera, when Johann Strauss Jr.’s popular Viennese farce was presented at the Madison High School auditorium in December of 1964. A solid cast of principals who were equally at home in the realm of comic timing, made it all work, starting with Daniel Belcher in the role of Gabriel von Eisenstein. Belcher marvelously captured the impulsiveness, bravado, and fatuousness wrapped in charm of von Eisenstein. His baritone exhibited an engagingly warm, ringing tone that was pure gold. As von Eisenstein’s wife, Rosalinde, Mary Dunleavy sang with assured grace even in difficult situations like when she had to fend off the groping Alfred (Ryan MacPherson). Her singing of the csardas inspired “Klänge der Heimat” (Sounds of the Homeland”) was a highlight of the evening. MacPherson was an ardent and agile Alfred, singing with panache while climbing over window sills or pulling Rosalinde on top of him while reclining on a divan. Susannah Biller sparkled as Adele with a brilliant tone and terrific precision, and her singing of “Mein Herr Marquis” was a gem of a number during the big party scene in the second act. Jennifer Rivera drew lots of laughs as the dour and bored Prince Orlovsky, especially with the triple-gestured salute that she gave to her guests. The best surprise of the evening was André Chiang’s formidable baritone in the role of Dr. Falke. This bodes well for Chiang a former Portland Opera Resident Artist, and his burgeoning career. One of the current resident artists, Ian José Ramirez, aptly conveyed the mannerisms of the fretful Dr. Blind, yet he needed to project a lot more in order to be heard. The orchestra, under Music Director George Manahan, sounded exuberant and slightly expansive like a good Tokaji. The chorus, prepared by, prepared by Nicholas Fox, sang with gusto. The scenery, provided by Seattle Opera, and costumes, by Washington National Opera, were traditional, providing context that set the story in the late Nineteenth Century. 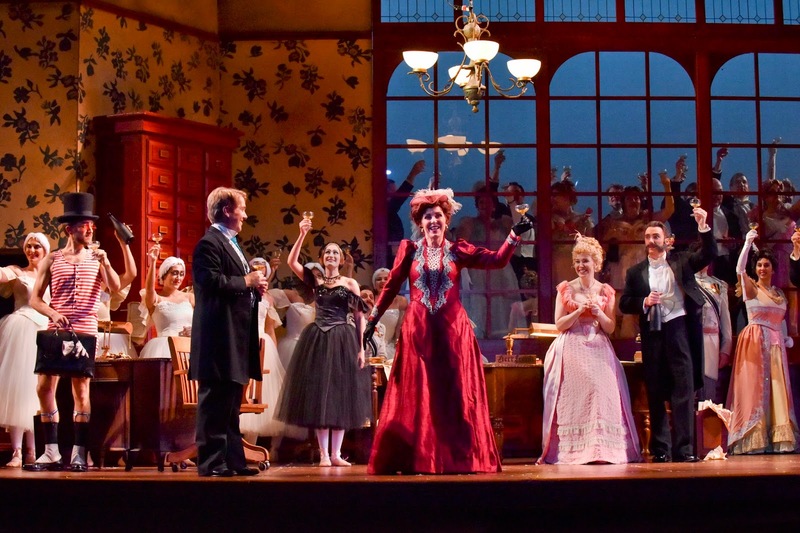 “Die Fledermaus” is one of those operas where you have the liberty to cut some passages and insert others. So during the jailhouse scene, Adele followed a glittery "Spiel ich die Unschuld vom Lande" ("When I play the innocent from the countryside") with “Frühlingsstimmen,” (“Voices of Spring”), which most folks recognize in its orchestral version, but it does have text, and Biller sang it with élan. And while she sang, a ballet of office chairs with damsels propelled by Ivan (Lance Hunter) swirled about. Director Chas Rader-Shieber made sure that there wasn’t a dull moment and that the interactions between the characters flowed smoothly. Assistant Director and Choreographer Matthew Ferraro added several humorous touches, including a sequence in which some of the female dancers take a tumble down the grand staircase at Orlovsky’s palace. The character of Frosch the jailer got a refreshingly new take. Usually he is a good-natured drunk who has just enough charm to win over the audience. In this production, Frosch (Rick Huddle) was totally alert yet a little spooked by the mysterious lighting at the jail. Members of BodyVox, including one of its artistic directors Jamey Hampton, made special guest appearances during the party scene in the second act. These were very witty and athletic performances that the audience ate up, yet Orlovsky remained unsmiling. For each performance, different special guests have been invited, and that should continue to make this anniversary production of “Die Fledermaus” an delightful crowd-pleaser. Kahane is a terrific artist who has performed in Portland a number of times. After the orchestra opened the Gershwin with a splashy, showy fanfare, the spotlight fell on Kahane, who deftly introduced the dreamy, bluesy melody that suggested someone cruising Broadway when it was still referred to as The Great White Way. That seemed to inspire the orchestra to stir up things with a flashy passage that then shifted back to the pianist and together they painted a jazzy scene that had real snap to it. The mood segued to a dark, smoky nightclub scene, with kudos to Jeffrey Work, principal trumpet in the second movement. The third, fronted by Kahane’s pulsating pianism, had an uptempo and uplifting feel. I was most interested in hearing Prokofiev’s “Cinderella Suite,” a 45-minute selection of pieces from his full ballet score. A real help in this performance was the use of projected titles which provided the storyline for each segment of music. Under Kalmar’s baton the orchestra established the brooding atmosphere right away. The quarreling stepsisters came through grousing sounds from the violins and woodwinds with sharp jabs from the brass. The violins spun a sinewy web of sounds that created the atmosphere of the Fairy Godmother who changes a pumpkin into a carriage. The woodwinds were in top form, creating elegant sounds for the dances at the ball, and the orchestra created a suspense as Cinderella and the Prince dance together. Then came the big highlight with the woodblocks whirling and and the brass section making a heavy glissando of everything falling apart as the midnight bell sounded. It was a really terrific moment that I think could have been even more terrific if the woodblocks could have gotten louder and louder. I only mention this because I got to hear Valery Gergiev and the Kiev Orchestra do this piece in New York City several years ago. The overwhelming loudness was so incredible impressive that I’ve never forgotten it. Still, the Oregon Symphony’s interpretation was absolutely valid and the lovely threading of the sound from the cellos and the violins as Cinderella and the Prince find each other was magical. The concert began with an impeccable performance of “The Sorcerer’s Apprentice.” An air of mystery and wonder was invoked at the beginning and enhanced by the strings finishing off the introductory phrase with a straight tone – absolutely no vibrato. Principal bassoonist Carin Miller Packwood and her colleagues played with panache. A brief and elegant solo by principal violist Joël Belgique and some wild curlicues on the piccolo by Zachariah Galatis added to the brew that the orchestra and Kalmar cooked up. It was spellbindingly fun to hear! Chas Rader-Shieber and Matthew Ferraro shed some light on the stage directions and choreography for "Die Fledermaus"
Fifty years ago, Portland Opera presented "Die Fledermaus" as its very first production. So, it is especially fitting that the company celebrate its gold anniversary with Johann Strauss Jr's most famous comic operetta. To learn more about the production, I talked with director Chas Rader-Shieber and choregrapher Matthew Ferraro. I started the conversation with Rader-Shieber. I was looking at your bio and realized that you’ve been directing for quite a number of years. You were directing your parents! Rader-Shieber: Yes. They will tell you that I was. When did you become a stage director? Rader-Shieber: There really wasn’t a point in time where I could say that I was a stage director. You just discover that you have a love/passion/need for the theater. You have to figure out how you want to participate. Are you a performer by nature? Since childhood, I’ve been interested in theater. I had to find my way and figure out how to participate in it. So you decided on opera rather than the spoken theater? Rader-Shieber: I found that opera – in the best sense of the word – exploits more. It offers more elements to play with. It’s more satisfying to me. I miss the music in spoken theater. I just don’t understand why they aren’t singing. It all seems natural to me. Rader-Shieber: I am not. I don’t even sing Happy Birthday. Did you direct theater in college? Rader-Shieber: Yes. I directed the Columbia Players at Columbia University. I transferred to Carnegie Mellon as a designer and then stayed on for a Masters in directing. I directed spoken theater there. By the time I went to college there was no question where I going to end up. The designing studies were done with an eye toward direction opera. Did you get a big break into opera directing somewhere? Rader-Shieber: I worked as an assistant for a couple of years, and then was very fortunate to take on the artistic directorship of a small opera theater company in Milwaukee, Wisconsin. It was Skylight Opera and is now Skylight Music Theater. I was there for a few years, and then went fully freelance as a director. You’ve freelanced all over the place, including Tasmania. Rader-Shieber: It’s the most fantastic place. I’m a great lover of Australia, and I’ve been fortunate to have done a couple of shows in Sydney. But Tasmania is amazing, and they have a wonderful Baroque festival there with two solid weeks of concerts and events. Speaking of Baroque, here with Portland Opera’s young artists, you directed Handel’s “Rinaldo” at the Newmark Theatre. Now you are directing at the Keller Auditorium, in a big production of “Die Fledermaus” with a big cast of principals and chorus. Do you need a bullhorn to direct all of them? Rader-Shieber: No, not at all. The joy of rehearsing is that the scale of rehearsal is completely different than what you see in the theater on opening night. When you are rehearsing 39 people in the chorus, I am as close to them as I am to you. So there’s no sense of moving great hordes of people around. We work in one scale in one way with the understanding in the back of our minds of how this is going to transform when it gets into the theater. The audience takes its seat in the theater, and sees a curtain hanging there. The beauty of the theater is that it asks the question: “What’s behind the curtain?” So before the show even starts there’s an interactive thing going on. Then the curtain goes away and the story starts. The storyline in “Die Fledermaus” is very silly and has a lot of twists and turns. Do you work hard with the principals to bring out the humor? Rader-Shieber: Do you know what the secret to comedy is? It’s casting. That’s what makes good comedy. I don’t make the comedy. Portland Opera casts really well. I can’t make a person funny. You have to have singers who get it. They are entertaining people to be around, and they bring that to bear on the stage. This is just a great cast. One of the non-singing characters I have enjoyed in the opera is Frosch, the jailer. I’m always interested in what he will do. Rader-Shieber: There are some surprises we have up our sleeves. The actor we have in this production is fantastic, and he doesn’t just appear as Frosch in the third act. He makes two other appearances in the opera; so he’s in all three acts as different characters. For Fledermaus what does the stage director do versus what the choreographer does? Ferraro: Some operas have set dance pieces. For example, I choreographed “Salome” for Stephen Lawless for the “Dance of the Seven Veils,” which lasts around eight minutes. He gave me the setup for it: that there would be seven women in the dance, but that was it. I didn’t do any choreography beyond that. But in Fledermaus, you’ve got ballroom parties going on and lots of waltz music. Ferraro: Yes, the choreography is much more integrated into the entire opera. Rader-Shieber: Plus there are moments that you think are dance moments that become danced sometimes. The relationship of work between the choreographer and the director are more fluid in this opera than many other operas. That’s more fun for me. Ferraro: "Die Fledermaus" is a more presentational-stylized piece. It’s an operetta as opposed to an opera. The musical moments are much more like what you have in a musical where often at the end of a number when things become exuberant you need some kind of stylized movement or choreography to bring that home. We are trying to integrate the movement into the narrative of the opera. There is waltzing, but not waltzing for the sake of it. Ferraro: I was based in New York for 15 years. Now I live in Providence, Rhode Island. I was a ballet dancer for seven or eight years, then I started dancing for New York City Opera and the Met. 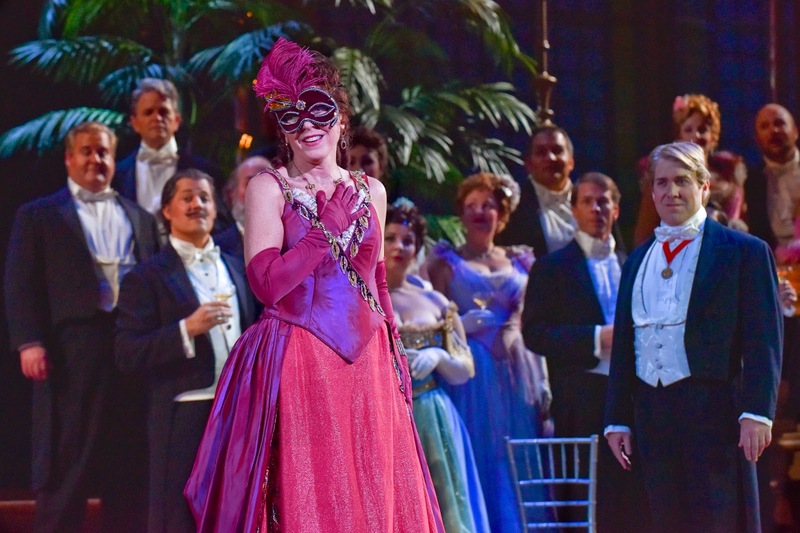 In this production of “Die Fledermaus,” you have some special guests to fit into the story, or do they just do their thing? Rader-Shieber: There is no good return on trying to get special guests to fit into the story. You have to let them not fit in. You have to let them be exactly who they are and enjoy the oddity of that. That’s what makes them special.Ferraro: It’s always a non sequitur. Even at real traditional productions like at Royal Opera House at Covent Garden they will have some lounge singer walk into a 19th Century sing a popular tune. No one in the audience is going to call it into question. Ferraro: It’s always a non sequitur. Even at real traditional productions like at Royal Opera House at Covent Garden they will have some lounge singer walk into a 19th Century sing a popular tune. No one in the audience is going to call it into question. Rader-Shieber: The oddity is the fun. Ferraro: In fact, the more of a non sequitur it is, the funnier. The storyline is so silly. Ferraro: The silliness isn’t a hurdle. The silliness is the point. Nobody has to drag their husband to listen to Wagner for five hours. This is plain fun. Do stage directors put special markings in their score to help them figure out and remember what is going on where and when? Rader-Shieber: Without post-it notes, I do not exist. I also use many ground plans of the theater. Ferraro: It was originally called blocking because they would build a little mechanical model of the stage and have little blocks that represented each character. They would move the blocks around and write it down before they got to rehearsal. Rader-Shieber: Most set designers will provide a modelling scale – quarter or half inch. But all of the preparation that you do has to be tempered by the process in the moment. You think that things will happen a certain way, but something better comes along in rehearsal. Ferraro: I find that the things that you plan, if you are lucky, will only be as good as they were in your head. There are some things that you don’t plan that are better by far than anything you could have imagined. There are some choreographers who won’t plan at all - like Balanchine. He only choreographed with the dancers in the room. Sometimes in opera, it behooves you to plan. You are in a room with 70 people, and you don’t want to be staring at the floor. But some of the best ideas come when somebody drops something or somebody entered late or something else unplanned happened. Rader-Shieber: The third act of Die Fledermaus is notorious for getting all of those people in one room – at the jail cell – and you have to plan that, but in rehearsal things happen, and then it all goes even better. Scandinavians love strong, robust coffee, and it was that kind impression that Elmar Oliveira created in his performance of Sibelius’s Violin Concerto with the Vancouver Symphony on Saturday afternoon (November 1) at Skyview Concert Hall. 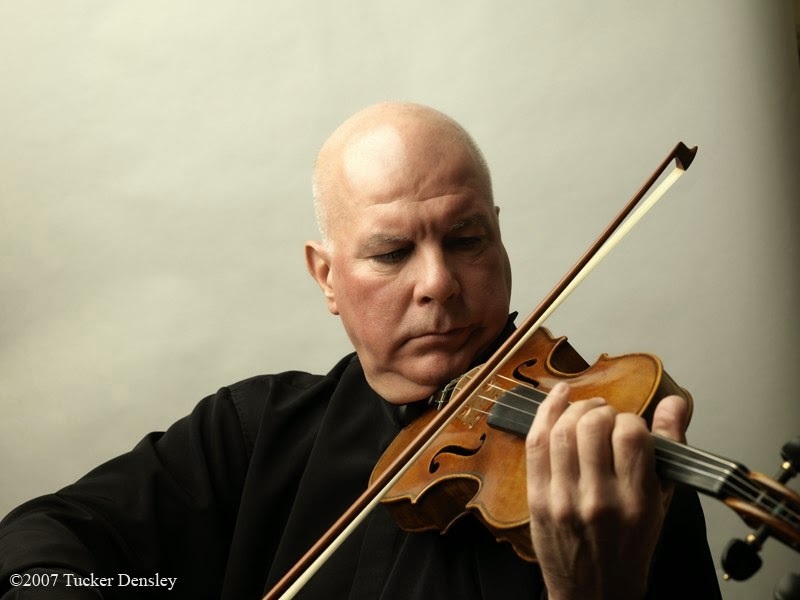 The internationally acclaimed violinist was the headliner in this orchestra’s second concert of the season, which also featured a lively, uptempo rendition of Shostakovich’s “Festive Overture” and evocative playing of the Prokofiev’s Seventh Symphony. Oliveira has been a familiar face in the Pacific Northwest, appearing with Chamber Music Northwest, the Oregon Symphony, and the Seattle Symphony. In this concert, which marked his debut with the Vancouver Symphony, he played the Sibelius Violin Concerto with assured artistry. His fleet fingers, after maneuvering through a minefield of notes, could stop on a dime and deliver a beautiful straight tone, delve into double stops, or glide into a quick glissandos with panache. What would have made the performance even better would have been some true pianissimos, because the volume level always fairly loud. Still, Oliveira’s playing won over the audience, which called him back to the stage three times. The orchestra made an emphatically positive impression with its playing of the Prokofiev’s Symphony No.7. Right from the first bars, the strings created a lyrical yet ominous atmosphere that made one wonder where this piece (written for a children’s radio broadcast) was going to go. Overall, sound between various sections of the orchestra was very well-balanced. Even when the brass section arrived on the scene, it didn’t overpower the strings. The principal members of the orchestra excelled in the many exposed passages of the second movement, and under the direction of music director, Salvador Brotons, that movement came to an exciting close. A number of fine solos punctuated the third movement, and the fourth transitioned deftly between a variety of moods and engaging tempos. The orchestra opened the concert with an energetic interpretation of the “Festival Overture,” one of Shostakovich’s most popular, short pieces. Brotons set the ensemble on a brisk pace that made the piece energetic and engaging. The sound of the strings got a tad blurred in the fastest sections, but the brass section was snappy, and principal clarinetist Igor Shakhman whipped through stream of notes with ease. I haven’t heard the Vancouver Symphony in a couple of years, but based on this concert, it seems that the orchestra has made some excellent strides forward with better intonation and execution. The positive changes bode well for the orchestra, and people who haven’t heard them in a while should check them out. The Oregon Symphony's Monday November 28th concert at the Arlene Schnitzer Concert Hall was an evening of principally Latin music centered around Joaquín Rodrigo's famous Concierto de Aranjuez, featuring New York-based Spanish guitarist Pablo Sáinz-Villegas as soloist. The first offering was Three Latin American Dances by contemporary American composer Gabriela Lena Frank. The first movement (Introduction: Jungle Jaunt) began with a flurry of an exposition that quickly developed into suggestive programmatic elements: one could almost see a trail of army ants as the timpani constantly rambled up and down, and ominous thunder could be heard in the background. The second movement (Highland Harawi) was spellbinding...use of rainsticks and spooky bongos over eerie, ever-present glissandi from the strings painted an evocative picture. As a haunting melody issued from the violas and cellos, occasional plinking from a wood block created a foggy atmospher, a sense of creeping, sinuous menace. The last movement (The Mestizo Waltz) was rambunctious, feeling like spaghetti western music. This piece was a real treat, and kudos must go to the percussion section for a spectacular job with a dizzying array of instruments. It was almost like a percussion concerto at times and it was extremely well done. Sáinz-Villegas began the Rodrigo with an understated flourish that gave a taste of what was to come...it was marvelous for this quality of sound to be so present at the end of a piano phrase with an orchestra in the background. The booming, glorious rasgueado themes that make the opening so famous were not overdone--they were bold, exclamatory, but not bombastic. An incredible sense of balance was one of the key features of Sáinz-Villegas' playing. In order for the transportative power of this concerto to be truly felt it must be realized in the hands of a master, and Sáinz-Villegas is just such a maestro. It would be impossible to wring any more emotion from the second movement--pure passion, yet controlled lamentation, if there is such a thing. The intense, tremulous vibrato he employed, the ancient Moorish modes that cry out from the depths of Spanish music like ghosts of a time long past made the end of the movement feel like waking from a half-remembered dream. By the last movement it was clear that this performance was almost an embarrassment of riches. On display in was Sáinz-Villegas deliberateness of articulation, coupled with a deftness and purity of line such that every chord voicing was crystal clear and balanced--there was nothing missing from the rich, deep tapestry. Rodrigo's Concierto de Aranjuez has become almost inarguably the most beloved guitar concerto in the repertoire for good reason. That fact, coupled with the unequaled expressivity and technical brilliance of Sáinz-Villegas and the consummate skill of the OSO under Carlos Kalmar's all combined to create an unforgettable experience. The applause afterward was tremendous, even for a city like Portland which is not know for being stingy with praise. Every bit of it, and more, was well-deserved. What can one say but thank you, Señor Sáinz-Villegas. Thank you, thank you.